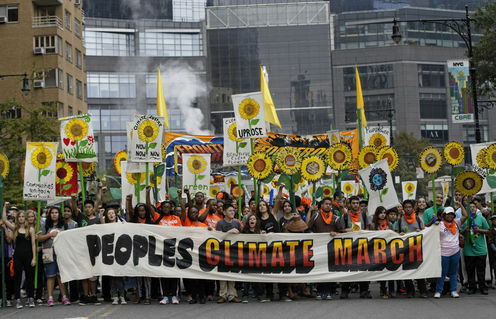 Who should political leaders follow when it comes to climate change: environmental scientists, powerful corporations, or a million marchers? Sometimes the three groups disagree, sometimes they concur; but even then, their claims to authority are based on different and frequently conflicting ideas. The recent United Nations climate summit highlighted the confusion over how best to make progress. Gaining agreement on an emissions treaty will require governments of all kinds to pitch in and there are competing ideas of how even democratic states make climate policy. One idea concerns supranational government: the dream of liberal internationalists since at least the post-World War I invention of the League of Nations, it is incarnated today in the UN. The organisation is founded on a utopian faith in the possibility of transcending narrow national interests in favour of the general good of humanity. This goal has proven elusive because the anarchic world of international relations, driven by economics and ethnicity, has resisted pacification. The other aspect of supra-nationalism is more technical, and has seen greater success. UN bodies such as the Food and Agriculture Organization and the World Health Organization are occasionally branded as political, but have become almost technical spaces for the application of rationality. This faith in a disinterested expertise that can triumph through the power of objective evidence dominates hopes for positive summit outcomes. A second view of the state regards it as subject to competing perspectives, which determine its conduct. Parliamentary democracies are open to influence when voices are loud, cogent, numerous and attached to material interests. The remarkable power of the oil, coal and gas industries is clear when lobby groups and unscientific deniers stake a place alongside technical experts. The UN’s Intergovernmental Panel on Climate Change does not have the same status as the FAO or the WHO, because of the opposition lined up against it. Politicians’ platitudes on the environment are easily uttered, even as their policies and programmes are based on ephemeral self-interest and pseudo-science. This gloomy reality dominates pessimism about the outcome of the summit, because corporate power and short-term priorities trump existential crisis. Then there is the idea that states are inherently undemocratic and hopelessly compromised by these interest groups, but can be forced through spectacle to watch, listen, and learn. This assumes that sovereignty resides in universal values expressed through righteous indignation that transcend government to represent the popular will in an unmediated way via civil society. Hence groups believing that anti-climate change gatherings of a few hundred thousand in a population of two billion signify a people’s message. Theirs was the authentic assembly, not the UN. There are fascinating contradictions at play here about knowledge and elitism. On the one hand, many environmental activists are animated by scientific research. On the other, they claim legitimacy through grassroots connections, not expertise. So bodies such as the IPCC are invoked, but experiential stories are privileged. Claims to organic community ties and a need for business and state transparency are asserted at the same time as small numbers of operatives work clandestinely to disrupt corporate activity. Hence Greenpeace occupying a coal train in England’s East Midlands last Tuesday while Leonardo DiCaprio and David Cameron were addressing an assembly on the Upper East Side. One of these activities is about agitprop and illegality, the other about speechmaking and legitimacy. One is naughty attention-seeking, the other is haughty attention-seeking. One claims to be community-based while being vanguardist, the other claims to be democratically based while being elitist. In the lonely hour of the last instance, alternatives must be found to the use of limited resources that in turn threaten our most basic resource, life itself. It’s clear that supra-national deals are necessary to mitigate the dangers we face, because the climate itself is supranational. Can and should the three theories come together to account for this mazy, hazy world of policy-making and offer better outcomes? We need the technical authority and quiet science that come with avoiding controversy and establishing proofs. The science is hard to contest, even as it is uncertain on some detail – and it should be, given the difficulty of prediction. We must also acknowledge that corporate power manifests itself again and again on national and global stages, and disclose its malevolent impact on public policy. And we should recognise that pranks by non-government organisations can draw attention to the silent and invisible way that fossil fuels can distort democracy and compromise sovereignty. All three ideas about states have their uses here: the technical possibilities of a rational world, the sceptical capacity to counter powerful distortions of the truth and the magical self-anointment of spectacle-based activism. If our crisis is to be averted – or rather, survived – we need contributions from all three models, despite their contradictions. Toby Miller is married to a Greenpeace campaigner and donates to the organization.